As artists' bursaries are offered for the ArtWorks conference in April, a-n's Director shares some of the thinking and research from the ArtWorks Scotland conference, which examined value and ethics in participatory arts. 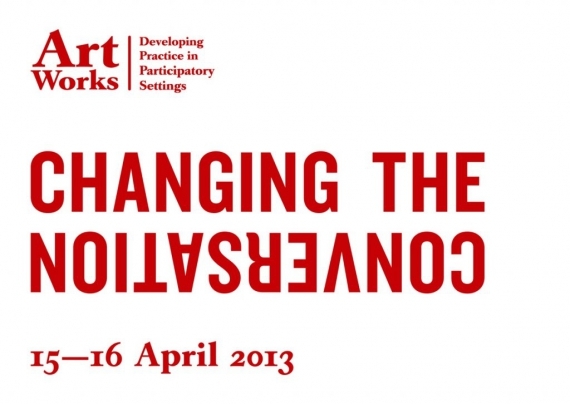 ArtWorks: developing practice in participatory settings, is a special initiative funded by Paul Hamlyn Foundation. It strategically supports the continuing professional development of artists working in participatory settings. As part of this, a limited number of artists’ bursaries are available for its Changing The Conversation conference in Preston in April. A workforce development scheme, ArtWorks aims to meet the needs of artists at different stages, from emerging artists embarking on a career and training, to experienced practitioners seeking to refresh and transform their practice. Last November, the ArtWorks Scotland conference, Art, Society and Participation: Constructing the larger narrative, examined thinking around value and ethics in participatory arts. It brought together over 120 practitioners and social activists for two days. A presentation by educationalist Charles Chip McNeal focused on artists’ professionalism. “Creating a culture of collaboration requires more commitment and change than most people think,” he said. “Yet it is needed now more than ever before.” Artists, he suggested, are multi-interpretable: they may be perceived as cultural facilitators, aesthetic advocates, creative conduits and socio-cultural mediators. Such a list of definitions can be lengthened, to include artists as practitioner-teachers, animateurs or community activists. Two surveys of artists produced by Artworks Scotland in infographic format provide a valuable snapshot of their hopes and intentions for their practice and how it is supported and enabled. Significantly, perhaps, consultations indicate that whilst 89% recognise that enjoyment of working with people is a driver to working in participatory settings, for 84% such work is more a source of income. The Paul Hamlyn Foundation Artworks initiative is being delivered through consortia located in London, North East England, Wales and Scotland, augmented by the specific practitioner grouping Navigator Artworks, of which a-n is a partner. Organised in partnership with Higher Education Academy (HEA) and Creative & Cultural Skills (CCS), the ArtWorks conference, Changing the conversation (15-16 April) at Lancaster University, will create dialogues between HE and FE providers, teacher-practitioners and researchers, artists and arts organisations, to address the needs of artists at different career stages within participatory arts. Speakers include Eric Booth (Music National Service initiative USA), Anna Cutler (Director of Learning, Tate) and Steve Seidel (Director of Arts in Education programme, Harvard Graduate School of Education).